So far, it’s available in Europe and Australia and will cost you £169/AU$299 (around $220). On paper, the Alcatel A5 LED is just about exactly what you’d expect for that kind of money. The pricing means that it’s going head-to-head with the budget crowd, taking on phones like the Wileyfox Swift 2 Plus and our current budget pick, the Moto G5. It’s going to take more than some LEDs to beat that kind of stiff competition. Chinese manufacturer TCL Communications, also maker of the BlackBerry KeyOne, has been churning out budget and mid-range phones under the Alcatel brand for years now, so you might expect them to be getting good at it. Unfortunately, the A5 LED is a mixed bag with some serious problems. The cynical among you might discount the light show as a gimmicky distraction to the weaknesses of this phone. Let’s find out if you’re right to do so. 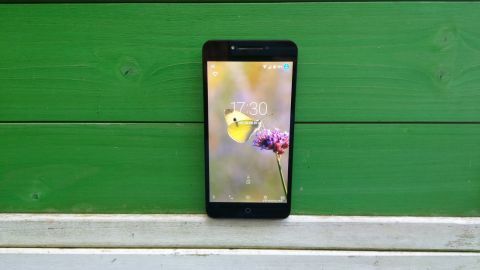 The official price of the Alcatel A5 LED in the UK is £169, but you can already get it a bit cheaper at Argos, where it’s currently listed at £140, or you can snap it up on pay-as-you-go at Vodafone or Giffgaff for just £99 and a £10 service bundle. If you’re in Australia, you’ll need to pay AU$299 to get an unlocked Alcatel A5 LED. The phone is set to be released in the US at some point, where we imagine it will cost somewhere around $220 based on the UK price, though we wouldn’t be surprised if it came in under the $200 mark. If this was just the Alcatel A5, minus the LED back, then there would be little reason to consider it. But slap an array of colored lights on the back and it becomes the Alcatel A5 LED – the ideal phone for party people who’ve blown their budget on partying. You’d be forgiven for thinking that the decision to slap an alternative LED back into the box came late on when the manufacturer realized how truly boring this phone is, because when you first unpackage it, there’s a slim, black plastic back on there with a subtle brushed metal pattern. Dig deeper and you’ll find the chunky LED back plate. Snap it into place, fire up the special Light Show app, and feel your cynicism wash away as it bathes you in a rainbow of glorious flashing glare and dazzle. Put it face down and it looks just like a disco dance floor for Lego people. There’s a surprising array of options in the comprehensive Light Show app. You can have the LEDs light up for incoming calls and notifications, of course, but you can also sync the light show to your games or music, choose from ten pre-made light shows, or make your own. There’s also a ColorCatcher app that allows you to snap a photo of something and generate a theme based on the colors. These themes extend to the LED back, though we can’t see many people wanting the LEDs to light up constantly when they’re using their phone. It’s fun, but ultimately it’s a silly gimmick, albeit a silly gimmick that the makers have really committed to. If you ever longed for an LED array on the back of your phone, the Alcatel A5 LED is going to delight you. The question is – has anyone ever longed for an LED array on the back of their phone? The Alcatel A5 LED is a chunky, sturdy-feeling, plastic phone. The front is all-glass with a speaker for calls at the top, flanked by the front-facing camera and flash, and the standard Android capacitive touch buttons at the bottom. There's a permanently visible round symbol for the home button, with the back and multitasking buttons just lighting up when used. On the right spine, there’s a lightly textured power button with a volume rocker above it. Up top we have a standard 3.5mm headphone port, and the bottom edge hosts the main speaker, microphone, and micro USB port. Flip over to the back and you’ll see the camera and flash in the top left corner. The Alcatel A5 LED comes with a slim, dark plastic back with a brushed metal effect, or you can switch in the thicker, grille-patterned, partially translucent cover that houses an array of 4 x 9 multi-colored LEDs. Switching covers, or indeed fitting the SIM or microSD card requires you to prise off the back, which extends around the frame. There’s a small slot to stick your nail into, but the covers are quite tough to remove. The LED cover looks quite good at rest, but it’s sure to grab the attention of your friends, colleagues, and random passers-by the minute it lights up. The general reaction was a bemused smile, but my kids (who are 8 and 5 years old) really loved it. Unfortunately, the LED cover renders NFC useless, so you’ll need to switch to the slim back if you want to use that. Ultimately, it’s a dull, but inoffensive design and the only omission that rankled is the complete lack of a fingerprint scanner, meaning you’ll need to rely on an old-fashioned PIN or pattern to protect your phone from prying eyes. Disappointing when you consider that the Moto G5 has a nice indented fingerprint sensor on the front. Your phone’s display is one of the most important features, because you’ll probably be staring at it for hours and hours every day. The Alcatel A5 LED has a 5.2-inch IPS LCD. It’s a decent enough size, and you can crank the brightness up fairly high, but if you aren’t dead-on when viewing it, then it goes dull quickly. Colors are quite good and there’s a MiraVision calibration tool in the settings, so you can fine tune it to fit your preferences. We’re disappointed by the 720 x 1280 resolution, considering the Moto G5 has a smaller screen, but manages to be 1080p. The screen isn’t the worst thing about the Alcatel A5 LED, but we would have preferred a 1080p resolution in a screen this size.